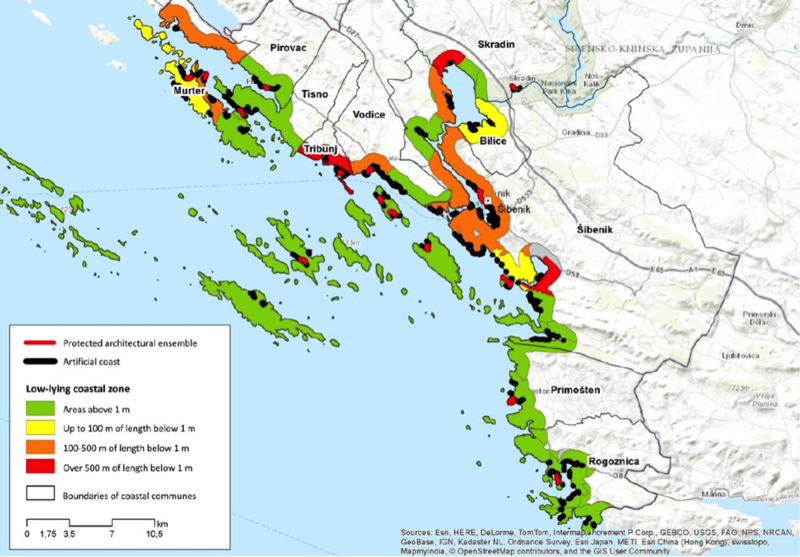 The Coastal Plan for Šibenik-Knin County was developed by PAP/RAC and Plan Bleu as part of the UNEP/MAP project "Integration of Climatic Variability and Change into National Strategies to Implement the Protocol on ICZM in the Mediterranean” (ClimVar & ICZM), within the framework of the MedPartnership initiative. Being a pilot plan, it is not legally binding. It proposes a vision for the desirable future of the Šibenik-Knin County coastal zone as well as key management policies and measures. In this perspective, the plan does not design/regulate land or sea uses and is not a substitute for official spatial planning. Its main focus is on resilience and adaptation to climate change, coastal water management and sustainable spatial development. The plan also addresses a number of issues which are relevant for MSP, including in particular: coastal and maritime tourism, aquaculture, biodiversity preservation and measures for coastal protection. Measures to improve adaptation to climate change of these sectors (and a number of coastal issues) are identified by the plan. Moreover, the coastal plan recommends the elaboration of a marine spatial plan for the Šibenik-Knin County. The preparation of the coastal plan started in January 2013. It was finalised in December 2015 and adopted by the County Assembly in April 2016. The Coastal Plan for the Šibenik-Knin County was developed within the project "Integration of climatic variability and change into national strategies to implement the ICZM Protocol in the Mediterranean" (ClimVar & ICZM). This is a collective effort to promote the use of ICZM in Mediterranean countries as an effective tool to deal with the impacts of climate variability and change in coastal zones. The project started in January 2012 and was completed in December 2015. The project was led by UNEP/MAP, within the framework of the MedPartnership initiative. Its executing partners were PAP/RAC, Plan Bleu/RAC and GWP-Med. Within this context, the Coastal Plan for the Šibenik-Knin County, as foreseen by the Protocol on ICZM in the Mediterranean, recommends ways to increase the resilience of coastal zone and sustainability of its development. The coastal plan addresses the planning process defined in the MedPartnership project and is supported by PAP/RAC’s Guidelines for adapting to climate variability and change along the Mediterranean coasts. The plan is based on several assessments and was prepared for the coastal zone of the Šibenik-Knin County by a multi-disciplinary team of experts. The plan and those assessments were guided by local knowledge, expressed at workshops that paralleled the plan preparation. It is a pilot plan which is not legally binding. However, the Šibenik-Knin County adopted the plan, so it became an official (not binding) document. The Coastal Plan for the Šibenik-Knin County is an indicative plan. The plan is nonetheless largely in line with Croatian legislation on the spatial and physical planning of the Šibenik-Knin County. As stated in the “Lessons learned” document available in “ClimVar & ICZM” project’s website, it will feed into local spatial plans, a regional development strategy and other sectoral policy documents. The area covered by the coastal plan includes the whole coastal zone delimited according to the definition given in the ICZM Protocol in the Mediterranean (red line in the figure below). The area covered by the plan also includes the Krka river basin (yellow line in the figure below). Area covered by the Coastal Plan for the Šibenik-Knin County. Source: PAP/RAC. The preparation of the coastal plan started in January 2013. It was finalised in December 2015 and approved by the County Assembly in April 2016. Offer a platform for sustainable development of the Šibenik-Knin County coastal zone based on water as its fundamental resource, blue economy and smart specialization. The coastal plan may have an influence concerning allocation of EU funds linked to sustainable coastal development and coastal resilience. In addition to other things, the coastal plan contributes to protection, restoration and preservation of the coastal zone's resources. For each of these policies general measures are defined for the County, and specific measures are defined for each coastal settlement. The coastal plan is not a substitute for spatial planning and, therefore, it does not design/regulate land or sea uses. Its main focus is on resilience and adaptation to climate change, coastal water management and sustainable spatial development. In this perspective, the plan identifies vulnerable coastal zones to a number of climate change induced threats and proposes a set of coastal policies and measures. The plan also addresses a number of issues which are relevant for MSP, including in particular: coastal and maritime tourism (and the negative impacts on the marine environment related to its rapid growth), aquaculture, biodiversity preservation and measures for coastal protection. Measures to improve adaptation to climate change of these sectors are identified by the plan. Moreover, the coastal plan recommends the elaboration of a marine spatial plan for Šibenik-Knin County. Strategic Environmental Assessment was not implemented. Civil society (NGOs) – two interviews. Not relevant for the Coastal Plan for the Šibenik-Knin County.